At first it seems a strange title. 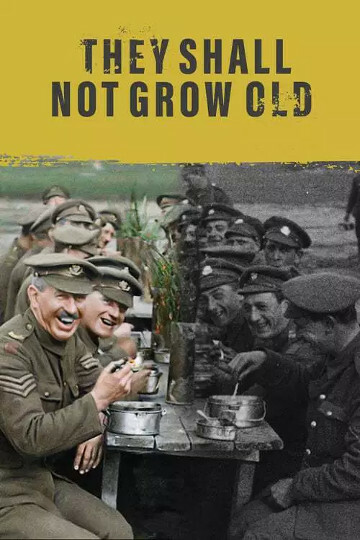 “They shall grow not old” is from Laurence Binyon’s epitaph on The Fallen of World War I, but the emphasis in Peter Jackson’s masterly film is firmly on those who survived it: the men who enlisted and went out to France, but lived and came home to tell us their story. Yet Jackson’s work has given them their own immortality, and indeed their own youth, by using modern technology to present them in a vivid sense of ‘now’. Colour is present from the start in garish propaganda posters against which we see glimpses of monochrome lines of recruitment, but when the action moves to France, reality switches for the viewer just as it did for the men themselves. 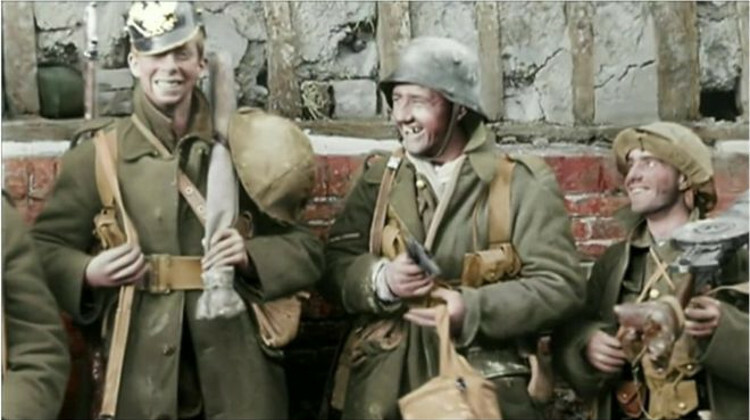 On the words “we were facing the Germans”, the black and white footage fades up into colour, and suddenly it is the men and the mud that are real, while the gaudy propaganda has disappeared into fantasy. And it works. 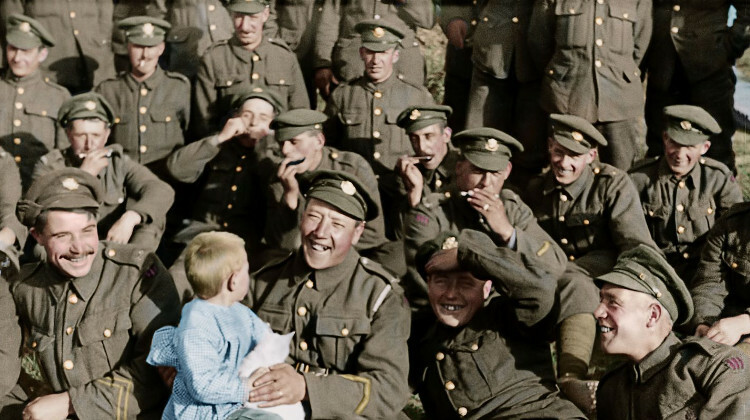 The colourisation can’t be perfect, and some faces remain vaguely pink blurs, but the impact is shocking, as historical stock-figures are metamorphosed into real men we might have known. The process may have accidentally lost some of the grime from suspiciously clean uniforms, but it exposes unromantic details like the horror of bad teeth, restores youth to previously grey faces, and gives devastating impact to our first sight of blood. I thought I was hardened to the idea of death in the trenches, but the first glimpse here was like encountering it for the first time. Yet perhaps even more powerful is the use of sound. Silent footage explodes into reality with an added Foley soundtrack, where the crunch of wheels, the squelch of footsteps, the rattle of cartridges and explosion of a mine have all been painstakingly recreated. Added ‘offstage’ dialogue means we hear distant orders, comments, and laughter where appropriate, but most effective of all is the ADR – the Automatic Dialogue Replacement, which has enabled actors to add words to match the lip-sync of men who are seen to speak. 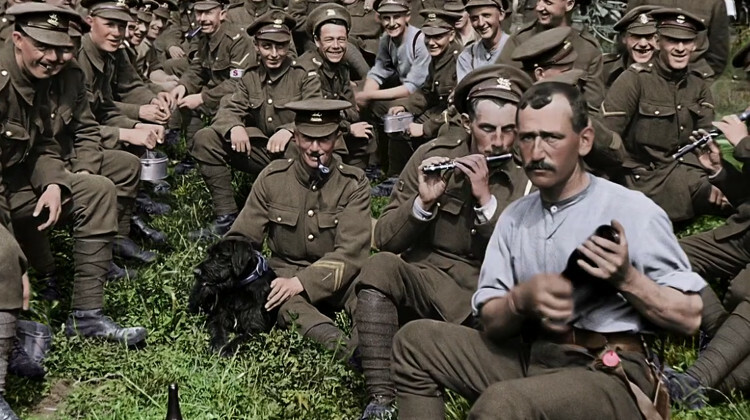 “Hello, Mum!” shouts one soldier cheerily to camera – to be heard by complete strangers a hundred years later. The dedication to accuracy is even reflected in occasional regional accents, always chosen to fit the regiment suggested by visible cap badges. Even so, Jackson is not afraid to use fiction techniques to make the material feel more immediate. WWI is a sprawling affair, but although the credits list narrators who served in many different theatres, this film presents a single narrative line which purports to follow a group of men from recruitment to training, thence to France, experience of the trenches, ‘rest periods’, first battle, dealing with prisoners – and the Armistice. The use of relevant images to illustrate what a narrator is saying create the impression that we are following a specific cast of characters on their individual journey, and encourages us to invest emotionally in what happens to them. The extent to which this succeeds can be seen in the final stages when Jackson intercuts between images of living men with memorable faces to footage of dead men with superficial similarities. It is highly unlikely they are the same men, but we respond as if they are, and feel an irrational but justified sense of loss. Some historians might disapprove, and when a narrator speaks they might want to know if this is Mons or Second Ypres, but perhaps the greater truth is more important than the detail. We are sharing an ‘experience’ of WWI through the voices of men who were there, and the very diversity of those voices gives us a truth I believe has been neglected – that there is no such thing as a single perception of a war, and not all soldiers are the same. This has never been more important than with WWI. The limitations of literacy have always made us disproportionately dependent on what might be called ‘officer evidence’, but our view of WWI comes almost entirely from the literate classes, and especially from the highly sensitive thinkers who make up the War Poets. Jackson shows us the other side, and from the very beginning of the film we hear men saying that they “enjoyed” the war, that they found it tremendously exciting and would gladly go through it again. One officer comments that rest periods offered time to “think more deeply” than ever before, but a less educated voice says of the same subject that they clowned around and “told rude stories”. Both are true, of course, but history falsifies itself when it listens only to the one voice. That may well seem strange to an educated officer of good family, but life was very different for a man going back to record unemployment and a civilian world which had already forgotten his existence. Both are correct, but only when we hear both sides do we approach truth. Jackson’s film gives us a powerful truth. It is narrow in scope, semi-fictionalized, and driven by his personal desire to pay tribute to his grandfather’s experience, but it does what all historical writers aspire to do, and makes history real, vivid, and profoundly relevant to us today. Co-commissioned by 14-18 NOW and Imperial War Museums in association with the BBC. Produced by WingNut Films and directed by Peter Jackson. 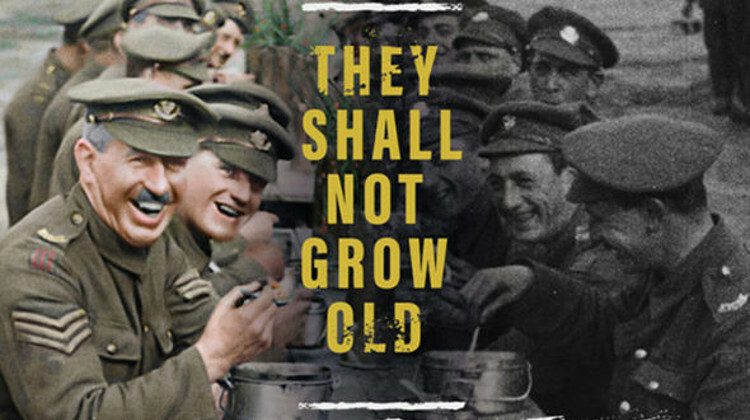 They Shall Not Grow Old’was first televised on BBC2 on Sunday, 11 November, and is available on BBC iPlayer until 18 November at 11.05pm. AL Berridge is the bestselling author of the Chevalier series of historical novels about André de Roland, of which Honour and the Sword was published in 2010 and In the Name of the King in 2011, both by Penguin Books. 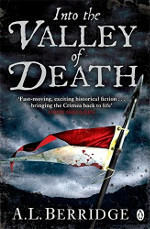 Her most recent book is Into the Valley of Death, a novel about the Crimean War.